Our KingsGate Cobham community was established in April 2016, initially spending an evening a week prayer walking the streets and later meeting in homes. We began formally meeting in various community halls from June 2017. We have been meeting in the Methodist Church in Cobham for the past 7 months and seen growth and fruit through unity with the local churches and community initiatives. A key prophetic word for us has been the story of Nehemiah and rebuilding the walls of Jerusalem. We, in partnership with the other churches in Cobham, are rebuilding the spiritual walls, where the living stones are people and the destiny God has for each one. God has been incredibly faithful, we are seeing a strong community developing and will often have visitors joining us on Sundays. We have a number of testimonies of breakthrough that God has done in people’s lives. We share a wonderful favour and friendship with other local churches and have been on the streets at Cobham Heritage Day in 2018 and will be there in 2019.. Our Tuesday night midweek meeting (Worship & Prayer) is our engine room for encountering God, hearing God’s voice for us and praying for our community and beyond. Men’s and Ladies Connects Groups alternate on Thursday evenings creating friendships and discipleship moments. 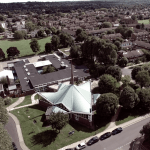 As the Methodist Church and URC church have become the United Church and relocated to the original URC building, the Methodist Church is up for sale and as KingsGate, we have put in a formal offer to purchase the building. The vision is for the building to be both a meeting place for KingsGate Cobham and to continue to be a launch pad for place for community service – eg Food Bank operates from the building. Thank you for praying with us and we look forward to praying with many of you in Cobham tonight.